Pepper is always alert and ready to go through her agility paces. Pepper needed a new start. 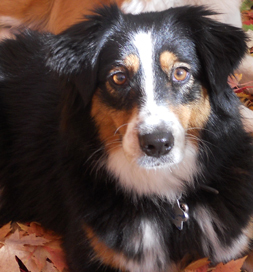 The Australian Shepherd had been rescued from a hoarder, who had kept her in a cage. As a consequence, she was extremely shy and nervous and had no training whatsoever. Doberman & Rottweiler Rescue in Paris, IL, took her in and posted her information on Petfinder. Her second chance came when Regina and Tom Snider of Rockport, IL, saw the listing. They were looking for a companion for their dog, Ginger, also a herding breed. They made arrangements to meet Pepper and knew right away she was the dog for them. The Sniders began to train Pepper in the basics – like housetraining, sit, come and stay. She was an avid student, so they moved on to more advanced training: beg, roll over, crawl and Frisbee. “She was really hard to train with the Frisbee, but once she got it, she really got it,” Regina says. “This past summer I bought a starter agility set. She goes through tunnels and jumps hurdles and hoops. We’re also working on a ‘stay’ mat, so one of the dogs will wait while the other is training.” Eventually, they may compete in dog agility. As with many rescued dogs, Pepper seems more than appreciative. “She follows me everywhere and likes to be touching me when I am watching TV,” Regina says. “She puts her head on my foot or leans against my leg.” Pepper has found her soul mate.